[207 Pages Report] The gas mixtures market size is estimated to grow from USD 28.20 Billion in 2015 to USD 36.76 Billion by 2020, at a CAGR of 5.44%. The gas mixtures market is growing rapidly in accordance with the growth in the industrial gas market globally. The use of gas mixtures such as oxygen mixtures, hydrogen mixtures, and carbon dioxide mixtures are used in the metal manufacturing & fabrication industry in order to enhance the arc characteristics or facilitate metal transfer in gas metal arc welding. This application is projected to foster the demand for gas mixtures during the forecast period. The report aims at estimating the market size and future growth potential of the gas mixtures market across different segments such as mixtures, end-use industry, manufacturing process, distribution mode, and region. The base year considered for the study is 2014 and the market size is projected from 2015 to 2020. Factors such as growing industrialization and burgeoning energy markets and medical sector are expected to be the major drivers of the gas mixtures market in the next five years. The gas mixtures ecosystem comprises gas mixtures companies such as Linde Ag (Germany), Praxair Inc., (U.S.) Air Liquide S.A. (France), Airgas Inc. (U.S.), Taiyo Nippon Sanso Corporation (Japan), Air Products and Chemicals Inc. (U.S.), Iwatani Corporation (Japan), Welsco Inc. (U.S.), and Advanced Specialty Gases (U.S.). MarketsandMarkets projects that the gas mixtures market size is to grow from USD 28.20 Billion in 2015 to USD 36.76 Billion by 2020, at an estimated CAGR of 5.44%. The increasing income and spending capacity of people in developing economies, increasing demand in various applications such as metal fabrication, electronics, medical & healthcare, automotive, and lighting is the major factor driving the growth of the gas mixtures industry. Additionally, with rapid urbanization, growth in infrastructural activities, and increasing industrialization and medical sector across the globe, there is a rapidly increasing need for gas mixtures. Gas mixtures are a wide and diverse group of products developed for application in specific end-use industries. Gas mixtures are used in electronics, fabrication of specialty alloys, lasers, metals, and other industrial applications. Metal manufacturing & fabrication is projected to have the largest market share and dominate the gas mixtures market from 2015 to 2020, as various applications of metal manufacturing industries use gas mixtures. Chemicals and medical & healthcare sectors are to play a key role in changing the gas mixtures landscape and grow at a high rate during the forecast period. Oxygen mixtures are projected to form the fastest-growing mixtures in the gas mixtures market as it is used in many end-use industries such as metal manufacturing & fabrication, chemicals, pharmaceuticals, and medical & health care. The merchant liquid distribution mode is projected to account for the largest market share in the gas mixtures market. Verticals such as tonnage distribution and cylinder & packaged distribution will be key growing distribution modes during the forecast period. North America is projected to have the largest market share and dominate the gas mixtures market from 2015 to 2020. Asia-Pacific offers potential growth opportunities, as developing countries such as China and India are projected to be emerging markets, making the Asia-Pacific region the fastest-growing market for gas mixtures. 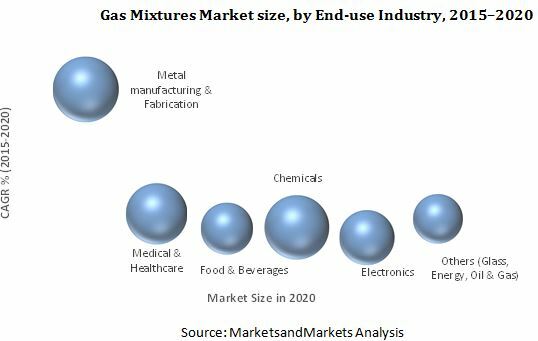 The growth of the gas mixtures market in this region is propelled by factors such as the growth of the metal manufacturing & fabrication industry, rise in demand for electronic products from the growing population, and economic development. However, due to high cost of gas processing and intricate manufacturing processes, the organizations are exposed to potential risks and are restraining the growth of the gas mixtures market. The major vendors in the gas mixtures market include Praxair Inc. (U.S.), Air Liquide S.A. (France), The Linde Group (Germany), Messer Group GmbH (Germany), Airgas Inc. (U.S.), Taiyo Nippon Sanso Corporation (Japan), Air Products and Chemicals Inc. (U.S.), Advanced Specialty Gases Inc. (U.S.), and Iwatani Corporation (Japan). These players adopted various strategies such as new product developments, mergers & acquisitions, partnerships, joint ventures, and business expansion to cater to the needs of the gas mixtures market. 13.5 Air Products and Chemicals, Inc.
13.7 Advanced Specialty Gases Inc. Figure 55 SWOT Analysis: Airgas Inc.